Step 1 . Gather all ingredients. Step 2. Lay out Royals on a serving platter. Step 3. Melt white chocolate and place in a resealable bag. Snip off the corner of the bag. Step 4. Pipe chocolate onto the Royals, allowing a little to run down the side. Top with one red Smartie on each Royal. Scatter mint leaves around plate. 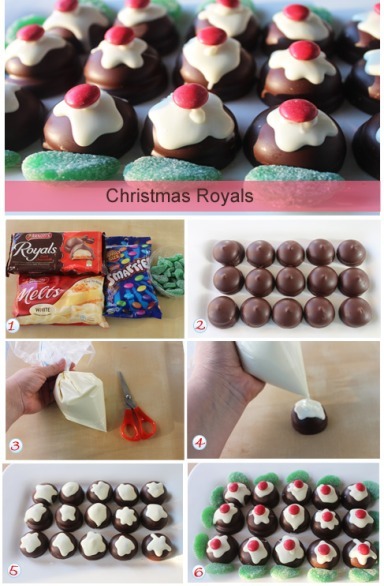 I used dark chocolate Royals but you can use milk chocolate Royals in place of these. If you are unable to find Royals just replace with Mallowpuffs. If you can’t buy Smarties then M & M’s are a great substitute. I melted the chocolate in a microwave oven. To do this you need to place the melts in a glass bowl and heat on high for 90 seconds and then stir for 1 -2 minutes. You may need to return it to the microwave for further 30 second bursts until it is entirely melted.